Imagine being tasked with teaching a classroom full of restless adolescents, all of whom have different learning styles, strengths, interests, and needs. Or perhaps this daunting scenario is not so far fetched at all. A team of innovative teachers at Middletown Middle School decided to try something vastly different in an attempt to increase student success in their classrooms: Blended Learning. Blended learning is a personalized, competency-based learning experience including increased student control over the time, place, path, and/or place of learning. When combined with devices in a one-to-one classroom, this instructional model increases student achievement, empowers students to take more ownership of their learning, and creates efficiencies for teachers that allow them to reinvest time saved in their students. These dedicated teachers muddled through the reading, research, and planning necessary to make the shift – not simply to technology-rich classrooms, which they do in fact have – but they’ve made the full instructional shift necessary for authentic blended learning. The positive impact on students is impossible to miss. 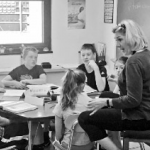 Two sixth grade language arts classes, populated with many of the same students, are supported by two content teachers, Cindy Cregar and Sarah Harrison, and a special education teacher, Amy Newkirk. The two content teachers and the special educator work together to plan and facilitate a station rotation model of blended learning. Each week, they pre-assess their students and use the results to create personalized playlists that support each student’s learning as he or she rotates among various student-led, teacher-led, high-tech, and low-tech stations across two classrooms. Lesson planning is complex, as most stations have three levels of difficulty and digital resources to support the various needs and interests of students. As a result, this model allows for more small group instruction, one-on-one support, student choice, and development of 21st-century skills. These sixth graders, who often come to middle school with significant gaps in understanding and a heavy dependency on the teacher, are notably more engaged, autonomous, and successful.